Have you ever considered how many of our problems are essentially invisible? Even physical pain—like, say, the blinding pain of a migraine headache—is internalized, and un-observable unless someone hooks the sufferer up to the kinds of machines that register what the body is actually feeling. As for doubt, fear, anger, frustration, loneliness, distrust… I’m sure I don’t have to tell you where I’m going with this. 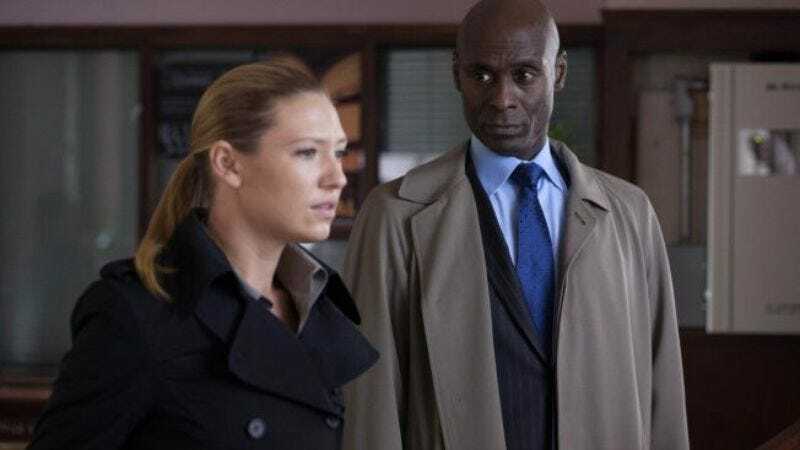 Invisibility is the dominant theme of this week’s Fringe episode, as externalized—well, sort of—by our freak of the week, one Eugene Bryant, a man who who was born so pale that fluorescent lights burned his skin. The doctors declared him dead at four days old, though he was actually smuggled out of the hospital by representatives of a subsidiary of the company that would become Massive Dynamic, which more or less purchased the kid from the baffled docs. They moved the baby into a lab, named him “Eugene” (short for “unknown genetic disorder”), and experimented on him to see if his condition held the secret to making human beings invisible. As it happened, the process of causing Eugene to disappear also saved his life. But now, ten years after a fire at that lab seemingly killed Eugene and every person in the building at the time, people are turning up dead, with white hair, red eyes and pasty skin. Is it possible that a still-alive Eugene is killing people and stealing their pigment, to render himself permanently visible? And is it possible that this process will bring about the death he avoided as an infant? The answer to both of those questions is “yes,” obviously. And in fact, my major beef with “Wallflower” is that too much of the episode travels in a straight line, at least in regards to the main case. There are very few complications when it comes to finding Eugene, and though Fringe Division doesn’t play much of a role in halting his killing spree, Eugene’s condition is such that he effectively stops himself, by hastening his own demise with every pigment-bath. I wish there’d been a little more dimension to Eugene as a character (so to speak), a la last week’s Raymond Green or the second episode’s John McClennan, or at least a little more excitement in the procedural elements of “Wallflower,” because there were moments in this episode that were really beautiful and touching, and I was disappointed that they were so isolated. I’m thinking here of the way that the visible version of Eugene is shot so that he tends to fade into the shadows, or the way he stalks a neighbor he has a crush on, by sneaking into her apartment and sprinkling her bed with flower petals. (Even when Eugene’s trying to be romantic, he’s creepy.) I’m thinking also of the nurse who remembers hearing “Baby Boy Bryant” crying as his tiny “corpse” was carried out, and of the way that Eugene is able to hide just as effectively when he’s visible, because no one’s ever really looked at him. These are sad little details of a sad little life. And then Eugene dies, immediately after his neighbor Julie sees him and acknowledges him, which means he dies content, which is either sweet or chilling, depending on whether you think a murdering weirdo deserves happiness. As is usually the case with the weekly plot of Fringe, Eugene’s plight in “Wallflower” is clearly meant to echo what is going on elsewhere: in particular the situation that Peter Bishop now faces. Fringe Division has Peter sequestered in his new house, where he’s working on plans to recreate some version of The Walternate Doomsday Machine and possibly find his way to his true home. Peter’s not even allowed to interact with civilians when he’s out on supervised shopping trips, because who knows what kind of crazy extra-dimensional damage he could do. The one person who treats him kindly is Lincoln Lee, whom Peter rewards by trying to help Lincoln win the heart of this dimension’s Olivia, initially by buying him a more handsome pair of glasses. Olivia though doesn’t get a chance to notice the new Lincoln—there’s that “being seen” theme again—because she doesn’t make it to her semi-date with him at an all-night diner. Instead, Olivia’s attacked by home-invaders, who inject her with a serum that fogs her short-term memory and appears to be the cause of the wicked headaches she keeps experiencing. And the mastermind of what I’m assuming have been frequent assaults on Olivia? None other than her beloved mother-figure Nina Sharp, who also knew far more about the sad story of Eugene Bryant than she probably should’ve. Nina claims earlier in the episode that although she and William Bell had nothing to do with the Eugene-napping of so long ago, she does believe that the experiments on the kid were a better fate for him than death, and important to the world at large to boot. Could it be that Nina has been looking after Olivia all these years so she could continue the too-important-to-ditch Cortexiphan experiments? If so, how devious: to earn a little girl’s trust, so as to be the threat she never sees coming. I feel I should insert a caveat into my reviews of this Fringe season, because increasingly I’m reading reviews by some of my friends and fellow critics—and by some of you as well—who are annoyed that the show’s writers have stranded us in this universe that’s not quite the one we know, with characters who aren’t quite the ones we’ve been following. Frankly, that only bothers me when it impedes the storytelling: when a goodly portion of any given episode is devoted to re-telling the history of this Earth and filling us in on the subtle changes. Otherwise, I’m not exactly drumming my fingers waiting for these people to go away. I’m finding the subtle variations of this new reality interesting, just as I did when the Earth-2 versions of these characters were introduced. I’ll admit that Amberlivia isn’t as fascinating as Fauxlivia, nor is Amber-Earth as neat-o as Earth-2. (Any world without dirigibles automatically loses some cool points.) And I’ll admit that I am expecting another shift at some point before Fringe wraps up for good, so my emotional investment in this place is stunted—though just to an extent, not completely. Ultimately, any complaints I might have about any given Fringe episode are related to the show as it is right now, not the show it was. Ditto any praise. I respect that you may feel differently, but that’s where I’m coming from. Either way, I hope to see you back here in January, when the season resumes. If you’re keeping score, this week we learned about yet another Massive Dynamic program that was aborted—this time because of a fire. During the commercial break, my local news teased a story about criminals who wave portable smart-card readers at the hip-pockets of passersby and steal their information. Invisible threats are everywhere!